Start by designing your LinkedIn profile based on the audience you want to reach and the skills and experience you most want to be known for in your professional life. The first step is to create a profile. 1Open LinkedIn.com in your favorite web browser. If you’re not already logged into an account on LinkedIn, the LinkedIn registration page opens. 2Enter your full name, e-mail address, and a password. Make sure you remember your password. 3Click the Join Now button. 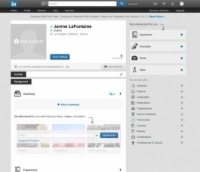 The Grow Your Network on LinkedIn page opens with your e-mail address in the address field. Simultaneously, LinkedIn sends an e-mail with a confirmation link to the e-mail account you enter in the registration form in Step 2. 4Open the confirmation message from LinkedIn. The message will have the subject line, Action Required: Please Confirm Your LinkedIn Account. 5Click the Confirm Your Email Address button in the e-mail confirmation message. The Grow Your Network on LinkedIn page opens. 6Click the Continue button or click the Skip This Step link. 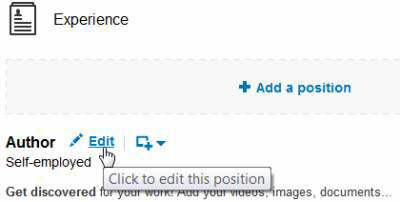 Continue: Click the Continue button, and LinkedIn searches your e-mail contacts for potential connections on LinkedIn and then gives you the option of inviting any or all the people in the search results. Skip This Step: Click the Skip this Step link to continue building your profile. Although LinkedIn doesn’t offer as many design options as some of the other social media sites, you’ll find a number of places on LinkedIn where you can improve both the appearance and effectiveness of your profile. 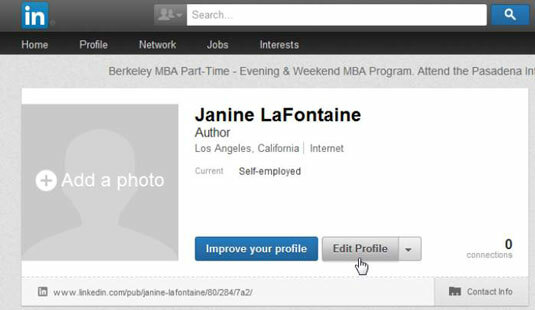 Skip This Step when you’re first creating a LinkedIn profile. You can invite new contacts any time after you have a profile on LinkedIn. It’s more effective to send invitations after you add more information to your profile. 7Click the profile icon at the top-right corner of the LinkedIn page to open your profile page. 8Click the Edit Profile button. The profile page changes to reveal a variety of editing options, including adding past work positions and education. 9Click any of the pencil icons or the Edit buttons and fill in your professional information. You can add as many past jobs, places of education, and other details as you choose. 10Click the Done Editing button, at the top of the page, when you’re finished adding new information. You can always go back and add, edit, or remove information later. LinkedIn is designed for professional connections. As you fill in your information, treat it like you would treat a resume, taking care to be accurate and to focus on your accomplishments and skills.